My husband and I started running. I don't know if you know this about me, but I (Mrs Christina Main) was once a pretty active runner! Growing up as your classic couch potato, I loathed running as a child. LOATHED IT. Hey guys, 20 minute miler over here! No joke- when it was "run a mile" day in grade school, I wanted nothing more than to break a leg (literally) and get out of that P.E. period. So come my early 20's (boy it feels weird being able to say that...shudder...) I decided enough was enough and I wanted to get in shape. So I took up running. Why? No clue. Seemed like the right thing to do. "I hate this activity so much, I might as well do it all the time". Right? Right. And I did! I somehow had a gym membership at the time (don't ask me how) so I would go 3-4 times a week BEFORE work (look at me being all active in my workout health!) and run on their lovely treadmills. Can we talk about treadmills for a second? What a lousy thing! Talk about giving yourself the worst case of false hope ever! I would run for what seemed like weeks on that darn thing! And fast! And perfect! I was the girl in the corner running like she was straight off of Baywatch or something. Perfect form, perfect timing, perfect breathing, glistening sweat. Just lovely. I was a running machine! So here's where treadmills are so lousy- if I wasn't on the treadmill, sayyyyyyy I decided that day to run ON REAL GROUND (gasp! ), I literally felt like an 90 year old man trying to jog down the street. My legs hurt. My feet hurt. I could only run for little spurts at a time! I was bent over, hovered close to the ground...arms trying to sway (but mostly just trying to keep from falling off)...lungs desperately trying to grasp any possible breaths they could. Which meant I sounded like an asthmatic 90 year old man, running. My glistening sweat straight up turned into drench covered skin. So now I really looked like a wet, dying, asthmatic, trembling....you know what I mean. Why??? Why is it so much easier to run on a treadmill??!?!?!?! Then my gym membership expired. A few years later, my then boyfriend and I were on our way to getting married. Which meant- time to get in shape (again). Having little funds for a fancy treadmill gym membership, I decided to "rough it" and try my best at running on the street again. I did pretty good! I actually got to the point where I could run a few solid miles without feeling like someone was going to have to call the ambulance on me! Winning! I loved it! I felt so free, and in shape, and healthy, and just...goooooood. Then we got married, then my running buddy (my little pug dog) died...and that running stopped. The End. I actually vowed never to run again. So here we are, 5 years later...and my husband and I want to pick up running and get back in shape. Actually if I am going to be honest, I've been wanting to run for a while now- at least a year. I just never had the courage to start it up again. But God's timing is always so loving and perfect and I kind of feel like He's saying to me, "Just go." All I can say is, "WHAT happened to my body in the last 5 years?!?!" Why do my knees hurt so bad?! Why does it take me DAYS to recover from one run!? I used to need one day in-between, now- I need like a good 3-4! Do we seriously age that fast??? Does being *this* close to 30 REALLY have that much of an impact on my active health?!! I mean shoot! Talk about feeling like a 90 year old man! My earlier version of a 90 year old man would do laps around my new 90 year old man. This is hard stuff! Kind of always was...but sheesh- is SO much harder now. I assume it's only going to get worse, the older we get, sooooooooo..... Blah blah. So going along with all things healthy and becoming "better us's" and stuff....we've decided (once again) to really purge our house of anything processed, sugar filled, and simple carb-a-licious. So basically, everything delicious that I have been hoarding since the past holiday season. Poo. Again, hard stuff, folks. BUT I know from past experience that my body (and my husband's) works and feels SO much better when we stick to unprocessed foods. So we've been slowly cleansing our bodies from white sugar and replacing it solely with alternatives like honey, maple syrup, etc. We're throwing out all the simple carbohydrates and replacing them with whole complex grains (like wheat berries, dried black beans, and red quinoa! Yum!! )- or having meals completely grain free altogether (hello, almond meal)! We've refused to buy any food item that has an ingredient list longer than a good paragraph and that includes "ingredients" that I can't pronounce. Good thing there's no Hawaiian words in those lists- YOU SHOULD SEE ME TRY AND PRONOUNCE ANY HAWAIIAN WORD. It's like my kryptonite. That's a different story for a different blog. BUT, we are human (and I love sweets) so although we're trying to purge of these foods, I do need to have some healthy replacement. Something that when cravings strike, I can easily run to, grab, and enjoy. Because honestly, if we didn't- it would be a quick run (who am I kidding, a long arduous run) to the grocery store for me (and I'd come back out with cake and cookies....and eat them all that night). One thing you probably already know is, we love making homemade popsicles. Love it. I mean, I thought making your own ice cream was easy! This is beyond easy!!! Popsicles...who knew!? 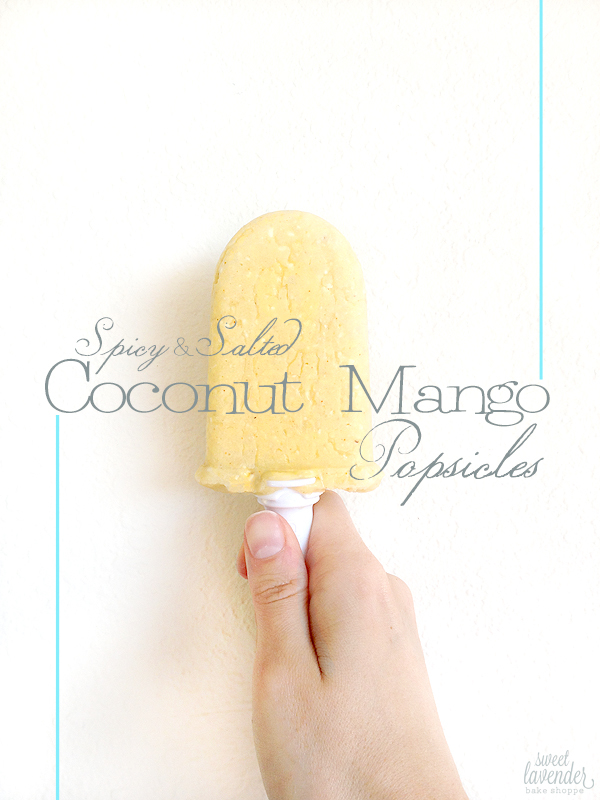 You basically blend a few yummy/good ingredients together, pour into your popsicle mold, and BOOM you're done. Hardest part? Thinking up a popsicle sure to send you straight into Flavor Town. So, I try and grab inspiration from anywhere! I carry a notebook in my purse and when ideas strike, I write them down. This candle shown above? My latest inspiration. I bought it from Anthro (oh that store!) a few weeks ago when we were on vacation and have had it lit almost every night since! It smells beyond good. 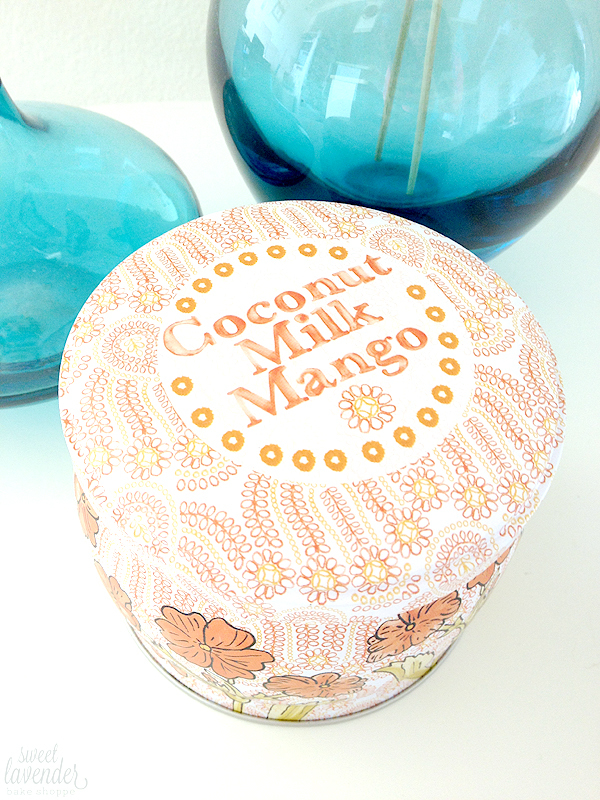 I mean...I could literally live in this little Coconut Milk Mango world for the rest of my life. 1. Make sure your popsicle maker is ready! For my Zoku maker this means the base was frozen in freezer overnight. 2. This works best if your frozen mango is slightly defrosted. Simply remove from freezer and allow to sit on kitchen counter about 5-7 minutes. In a food processor (or high powered blender) add all of your ingredients. Process and puree until completely combined and it looks like a smoothie. If you find your mix to be too thick (not moving around the processor), add a tad more liquid- this can be in the form of more coconut milk, coconut water, almond milk, or shoot- water even. Whatever you have on hand. Too thin? Add more frozen mango. You want mixture to be freely moving and very smoothie like. 3. Pour mixture carefully into your popsicle molds and freeze according to your manufacturer's instructions. 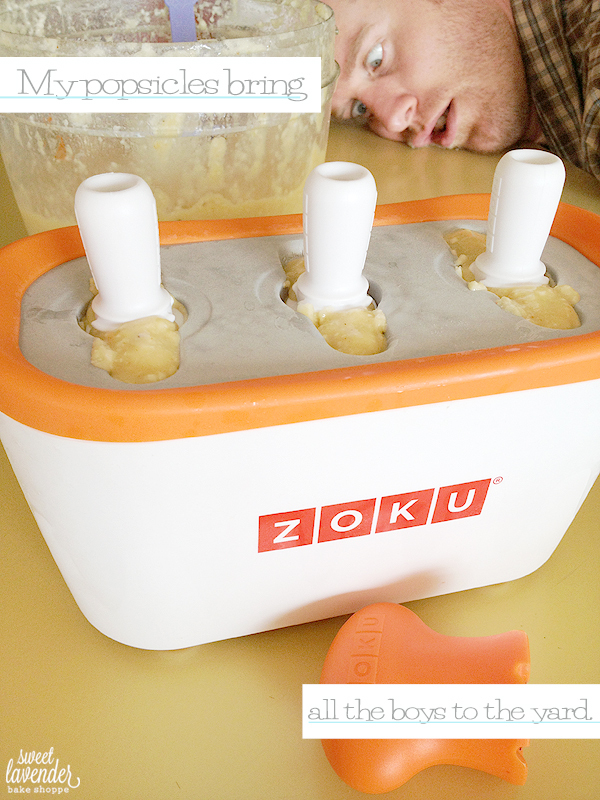 For my Zoku maker this meant: pour mix, add sticks, and allow to sit on counter for 6 minutes. 4. Once frozen, remove popsicle, wrap in plastic wrap, and place in freezer! Continue to make popsicles until mixture is used up or you run out of popsicle sticks, like we did. HA! 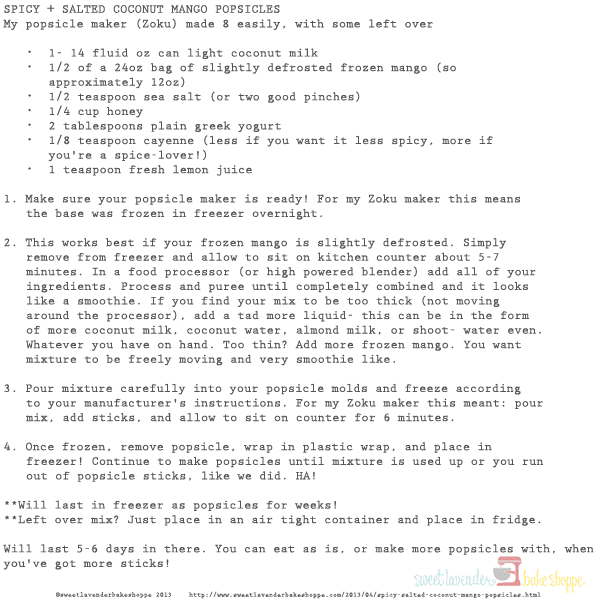 **Will last in freezer as popsicles for weeks! **Left over mix? Just place in an air tight container and place in fridge. Will last 5-6 days in there. You can eat as is, or make more popsicles with, when you've got more sticks! Wow, this recipe sounds fabulous!!! Thank you so much! You are SO welcome! Hope you like it!!! Hey! I found you on the BYOU Blog Hop and I'm so glad I did because I need to make these!! YUM!! !